The Lockhart River Art Gang from Cape York Peninsula is made up of young Aboriginal artists from the Lockhart River community. The best known of these artists are Rosella Namok, Fiona Omeenyo, Samantha Hobson, Silas Hobson, Adrian King and Terry Platt. Their work now appears in every major Australian public gallery. The concentration of talent is made even more remarkable by their age: all are under 30 and have been painting since high school. You can see works by these artists on our Lockhart River Paintings pages. Born in 1979, Rosella is an Ungkum speaker who grew up in Lockhart River. Her initial art training was at high school and then through the TAFE system. In 1997 she completed her training and took part in workshops with leading Australian artists and printmakers organized by the first art coordinators of the Lockhart River Arts and Culture Centre, Fran and Geoff Barker. Rosella held a very successful and influential exhibition in 1999 in Sydney. The success of this show launched the reputation of the Art Gang. Rosella began painting as a young girl when helping her father to decorate the bodies of dancers with ochre paints at traditional ceremonies. These ancestral markings are still strong elements in her art today, together with other traditional symbolic patterns learnt from her grandmother. She paints using her fingers to mark the thick acrylic layer, a method derived from the sand drawing style taught to her by her grandmother. Rosella has incorporated traditional aspects of her culture into her paintings, such as the Kaapay and Kuyan moiety stories, to prevent them from being lost to future generations. Other works illuminate more contemporary concerns, exploring the difficult conditions under which Aboriginal people still live today. Her paintings deal themes of violence, education, health, justice and the breakdown of traditional value systems in the modern world. Her paintings are an individual response to the problems of maintaining life and vigour within her native culture. Rosella’s work is included in all the major Australian galleries and in some international collections. Her work is often viewed as taking Aboriginal art in a new direction, linking the traditional with the modern. She was ranked amongst the 50 most Collectable Artists in Australia by the Australian Art Collector magazine for 2001 and 2002. 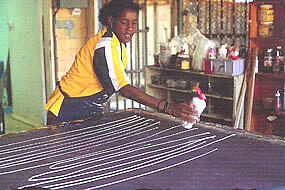 Namok’s first major award was when she won the Australian Heritage Commission’s National Indigenous Art of Place award in 1998. She held her first solo exhibition “‘Bout here” in 1999. In 2000 she won the Lin Onus Youth Art Award and, in 2003, received the Australian Centenary Medal for “distinguished services to Indigenous art.”. 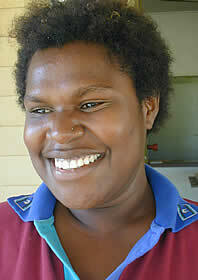 Samantha was born in the Lockhart River community in 1981 and is a Kuuku Y’au speaker. She joined the Lockhart River Art Gang in 1996 and her art training was through formal and informal TAFE courses. This included practical workshops with leading Australian artists such as Gary Shead. Samantha’s work, together with the work of other Lockhart River Gang artists challenges accepted notions of what Aboriginal art looks like. Samantha is one of the group’s most complex artists and her paintings are some of the most confronting to emerge from them. Her work often depicts concerns about domestic violence and social conditions within the community. Works suffused with strong swirls of colour capture the essence of mangroves, country and vivid flames of bushfires. Others are mixed with stark images of alcohol abuse, petrol sniffing and drug abuse, youth suicide and domestic violence. She has had several solo exhibitions since her initial exhibition in Brisbane in 2002 and her work is represented in major public galleries across Australia. Silas is a Kuuku Y’au / Wuthathi speaker who was born in 1978 and grew up in Lockhart River. He is a regular and committed worker at the Art Centre. His paintings have developed a distinctive style and imagery and his limited edition prints are of high technical quality. As he states: “My works are about my country and animals and they are a contemporary response to the traditional culture and isolation of my community.” He is also an avid football player and enjoys hunting and fishing. Fiona Omeenyo is another member of the Lockhart River Art Gang who is rapidly gaining a strong reputation for her distinctive style and use of colour. In 2001 her solo exhibition sold out on the opening night and her shows have been consistently successful since then. Fiona was born in 1981 and has been a member of the Art Gang since the late 1990s. Her imagery is based on key stories from the Umpila language group, and they relate to their history, their ancestor spirits, and to their relationship to their land. A recurring theme in her work is the Umpila clan story of Miiku who stole the two ancestral parrot-sisters before their planned marriage to Kuchuuy, the sea eagle. The sisters create the story place for her traditional country at Chester River.